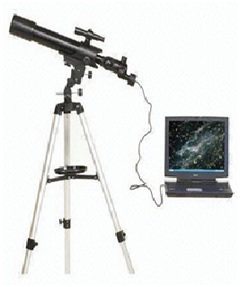 Explore the world and space in detail with a selection of SGM's telescopes and microscopes. This high-quality microscopesandtelescopes will allow you to see distant stars and microscopic nature with precision and clarity. The Universal Family Telescope allows you to capture a close-up look at the universe and natural wonders with adjustable eyepieces equipped with star tracking. SGM's Telescope is ideal for portability, whether you're tracking wildlife or meteor showers. The classic Brass Telescope is a collector's piece that combines a traditional mariner's scope with updated optics and a beautiful brass body. 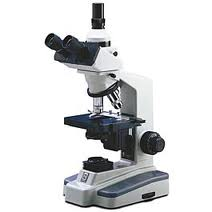 A monocular microscope is a modified refracting telescope used to magnify the images of distant objects. Volume and weight are less than half of binoculars making it easy to carry. The difference between Monocular and Binoculars is that Monocular produce 2-dimensional images, while binoculars add perception of depth (3 dimensions). The people who are visually impaired may use monocular to see objects at distances at which people with normal vision do not have difficulty, e.g., to read text on a chalkboard or projection screen. 1. Heavy model with built-in solid state transformer for 6v/20 watt halogen bulb. 3. Monocular head and paired eyepieces. 4. Monocular head inclined at 45° and moveable at 360°. 5. Separate coarse & fine focusing knobs. 6. Special socket and cord. The term binocular comes from two different words, with bi meaning two and ocular meaning related to vision. Together, these two words apply very well to a microscope with two eyepieces. This binocular view offers a number of advantages and the costs are comparable to a single eyepiece instrument. 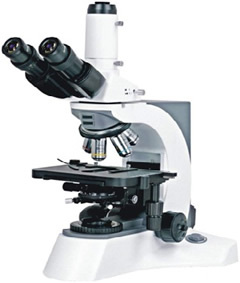 There are three basic primary types of microscopes: the student, the benchtop and the research microscope. Unlike a (monocular) telescope, binoculars give users a three-dimensional image: for nearer objects the two views, presented to each of the viewer's eyes from slightly different viewpoints, produce a merged view with an impression of depth. Binocular heavy model with built –in solid state transformer for 6v/20 watt halogen bulb, coaxial mechanical stage, special socket and cord, binohead and paired eyepieces. Heavy model with built-in solid state transformer for 6v/20 watt halogen bulb, Special socket and cord, Paired eyepieces. 1. Digital camera or digital camera eye piece with inbuilt USB wire or CCD camera. A trinocular is virtually the same as a binocular microscope but with a third eyepiece tube. No - not for people with 3 eyes, but for people who wish to attach a camera to the third eyepiece and be able to photograph or video what they can see through the two eyepieces. So, only consider a trinocular microscope if photography is a critical desire to do. One of the purpose is to allow a second viewer access to a specimen at the same time as the person who is mainly using the microscope. This means that an instructor can, for example, look at what a student is seeing to answer a question or to check the accuracy of the student's observations. In addition, the instructor can invite a student to share his or her view of an interesting specimen or when modelling how to adjust the focus. 1. Viewing Head:	Trinocular 45° rotatable 360°. 2. Eyepiece:	Wide field Eyepiece 10x / 18mm. 3. Objectives:	Anti Fungal Achromatic DIN Objectives 4x, 10x, 40x & 100x. 5. Mechanical Stage:	Double Layers Medical stage 140 x 140mm/ 75 x 50mm. 6. Condenser:	Abbe NA1.25 With Iris Diaphragm & Filter. 7. Focusing Range:	Coaxial coarse and fine adjustment 2 micron. 8. Illumination: 6V 20W Halogen Lamp or 3W LED, Brightness Adjustable. 1. Digital camera or digital camera eue piece with inbuilt USB wire or CCD camera. 3. Anti fungal SEMI PLAN OR PLAN ACHROMATIC OBJECTIVES. This microscope is also called dissecting microscope. 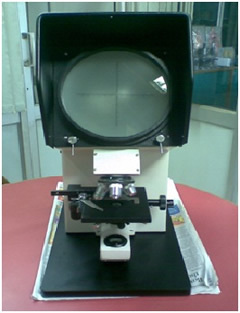 It is used for low magnification observation or a sample using incident light illumination rather than transillumination The stereo microscope is often used to study the surfaces of solid specimens or to carry out close work such as dissection, microsurgery, watch-making, circuit board manufacture or inspection, and fracture surfaces as in fractography and forensic engineering. They are thus widely used in large numbers in manufacturing, both for manufacture, inspection and quality control. It tends to make them of lower cost compared with conventional microscopes. 1. Binocular / Trinocular Viewing Head IPD 55-75mm. 2. Binocular / Trinocular inclined at 45° for comfortable viewing and rotatable through 360°. 3. Zoom Ratio : 1:5. 4. Extra wide Eyepiece Anti Fungal SWF 10x paired. 5. Magnification Range: 10x to 50x. 6. Working distance --- 82mm regardless of magnification. 7. Rack and pinion focusing system. Image remains clear and sharp throughout the whole zoom range. 8. Interpupillary distance adjustment 55 mm to 75 mm. 9. Transmitted light	--- 12v10w t-h lamp / 220v. 10. Incident light	--- 12v10w t-h lamp with reflector / 220v. 11. Packed in thermocole box. A fluorescence microscope is a microscope. The technique is used to study specimens, which can be made to fluorescence. The method used by all fluorescence microscopes is same. The basic task of the fluorescence microscope is to let excitation light radiate the specimen and then sort out the much weaker emitted light to make up the image. This technique has made it possible to identify cells and cellular components with specificity. Fluorescence microscopy is a rapid expanding technique, both in the medical and biological sciences. The technique has made it possible to identify cells and cellular components with a high degree of specificity. For example, certain antibodies and disease conditions or impurities in inorganic material can be studied with the fluorescence microscopy. 1. Side and top of Binocular/Trinocular is Head 30°. 3. Achromatic Objective FL4X, FL10X, FL40X, FL100X. 4. Smooth Coaxial Mechanical Stage. 5. Abbe Condenser NA 1.25 with Iris Diaphragm and Filter. 7. Smooth Coaxial Coarse & Fine Motion. 8. Illumination: Halogen Lamp 6V/20W, Brightness Adjustable. 9. Fluorescent attachment & Illumination: B(Blue), G(Green) Exciting Light Filter System O Ordinary Light System 100WHBO Mercury Lamp, Orange protection barrier & power supply. Metallurgical microscopes may either be inverted or upright. 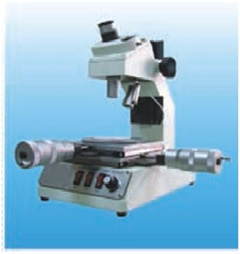 Inverted metallurgical microscope can be utilized for metallurgical applications and for a wide range of microscopy applications. Such as crystallography, sand casting analysis for iron metal foundries, metal patina analysis and for quality control. In other terms, the inverted version mainly lets the user study larger than usual objects. 1. Viewing Head: Trinocular Head Inclined at 300, Interpupillary 48-75mm. 2. Eye Piece: High-Point, Extra Wide Field Eyepiece EW 10X/20. 3. Objectives: Plan Achromatic Objective 4X/0.1∞/-WD25.4mm 10X/0.25/∞/-WD11.0mm 20X/0.40/∞/-WD6.0mm 40X/0.60/∞/-WD3.7mm. 4. Nose Piece: Quadruple Nosepiece. 5. Stage: Plane Stage 160x250mm, Φ 10mm, Φ 15mm, Φ 25mm. 6. Focusing: Coaxial Course and Fine Adjustment, vertical Objective Movement. 7. Coarse Stroke: 37.7mm per Rotation, Fine Stroke: 0.2mm per Rotation. 8. Kohler Illumination: Halogen Lamp 6V 3W. 9. Filters: Blue, Green, Yellow, Ground Glass. 10. Optional: Image Analysis Software for Metallurgical Microscope. Parallel optical system is probably a different way of saying "Common main objective" system. 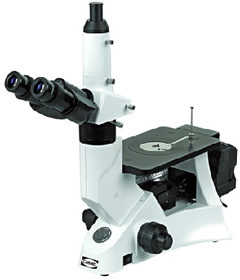 Common main objective stereomicroscope designs center on the refracting action of a single, large diameter objective lens, through which both the left and right channels view the object. Each channel operates as an independent optical train parallel to the other (this is the reason they are also known as parallel microscopes. 1. Head: Binocular Head(CSZ-806,808,810 enabled). 2. Eye Pieces: WF10X/22(CSZ-806,808,810 enabled). 3. Zoom Magnification: 0.8X~5X(CSZ-806 enabled) 0.8X~6.4X(CSZ-808 enabled) 0.8X~8X(CSZ-810 enabled). 4. Zoom Ratio: 1:6(CSZ-806 enabled) 1:8(CSZ-808 enabled) 1:10(CSZ-810 enabled). 5. Working Distance: 78 MM(CSZ-806,808,810 enabled). 6. Illumination: LED Illumination, Brightness adjustable(CSZ-806,808,810 enabled). 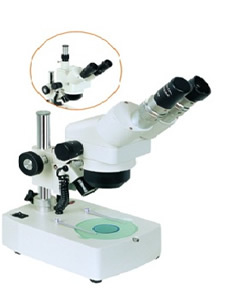 Projection microscopes are best and ideal to use especially for classroom applications. The projecting microscope forms a highly enlarged real image of some small object on a distant screen. It differs from the viewing microscope with which the viewer sees a virtual image, located in the same plane as the object at a distance of 25 cm from the eye - the closest distance of distinct vision. An advanced versatile projection microscope for measurement of specimens, different types of yarns in textile industries and research institutes. It is equipped with Halogen bulb of 12V/100 watt workable through a solid state built in transformer working on 220V AC mains. 200mm. dia graduated screen rotatable through 360°, built in fresnel lens with loop and arrow arrangement, coaxial mechanical stage. Built in adjustable compensating eyepiece is connected with magnification correction knob. Focussing through coarse and fine motion knobs. Quadruple nose-piece with four objectives-5x, 10x, 20x, 40x. Supplied in sturdy cardboard box wt. approx. 20kg. 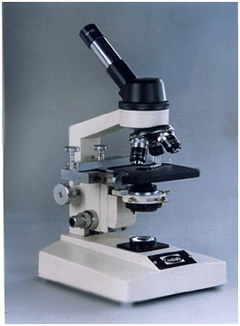 A tool maker microscope is a type of a multi functional device that is primarily used for measuring tools and apparatus. 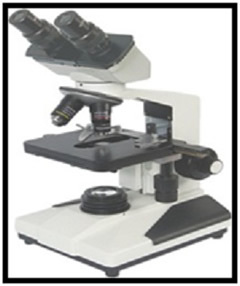 These microscopes are widely used and commonly seen inside machine and tools manufacturing industries and factories. These microscopes are also inside electronics production houses and in aeronautic parts factories. 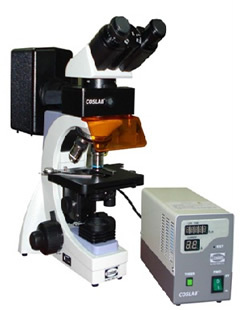 The microscope can be used for inspection as well as measurement. It is ideal for photo-lithographic labs, nano-technology labs, biomedical labs etc. where measurements are also required along with qualitative visual inspection. TMM-505 tool-maker's microscope is an excellent measuring instrument for non-contact inspection and 2D precision measurement. It is suitable to measure the small parts in the metrology department and production line, and it can be installed with digital measure heads, CCD adaptor, CCD camera, digital cross line generator, monitor to be a 2D vision system. 1. X.Y Axis Travel: 50*50mm. 4. Measuring Head: Mechanical measuring head. 5. Resolution of Measuring Head:	0.001mm. 6. Machine Head:	Monocular (aimer is adjustable). 7. Angle Dial:	Rotary angle: 360°; Minimum angle reading: 6′. 9. Objectives (176-138):	2X working diameter: 67mm. 11. Contour Illumination:	24V/3V tungsten bulb with green filter, the brightness is adjustable. 12. Surface Illumination:	24V/3V tungsten bulb, the brightness is adjustable. 13. Power Supply:	110/220V AC 50/60Hz. 16. Auxiliary Objectives:	A group of partition board; 1 piece of blue filter. 18. Optional Accessories:	1X, 3X, 10X Objective. 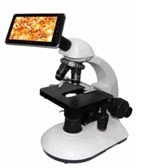 LCD digital microscope is suited for microscopes used in education, industry, medical, and R&D applications. 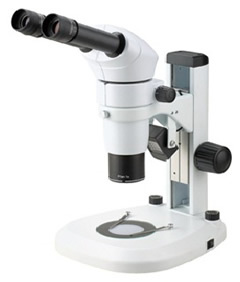 LCD microscope has unique features such as a built-in digital camera for snapshots or short videos of your specimens, three objective lenses, and top and bottom LED illumination to make this digital microscope the ideal tool for scientific explorers of almost any age. Brilliant and blur-free images, True color as same as CCD capture, Specially designed and optimized for All-in-one:Microscope with LCD pad for Preview, capture photo & video, storage, playback, processing, wireless Data Network, etc. Supporting the ever-growing Android Market, High quality entertainment is just a finger swipe away. Full Web Experience on-the-go, Keep you connected with friends, family and clients. Wireless Wi-Fi transfer and optional 3G internet access allows users to Webpages load instant, launch software manage content, upload, access online services. Share the information via Email, MSN, Forum, Blog any time wherever you go. 1. Digital Parts: 2 MegaPixels, 1/3 " CMOS Sensor, Full Resolution:1600 x 1200. Image-previewing Rate:15 fps at Full Resolution Connection:C-mount or Ocular Tube Adaptor. 2. Display: 7" LED Backlight LCD Screen (800x 480) G-sensor, Multi-point Capacitance Touch Screen. 6. Storage Device: 4G Flash, Support External TF Card, Maximum Capacity of 16GB. 7. Application Software: Photo/Video/Browser/Reset/Task/Calculator/Calendar/Clock/Dairy/Emails/Book/E-book/Music/Games/MSN/Skype/Gmail ect. System Software Support Various Android, Download with Android Market. 8. Buttons: Top Button- Turn on/off, Volume+, Volume –, Reset Front Main Button:Return, Home, Menu, Search. 13. Audio: 2* Built-in CLASS-D Digital Power Amplifier Loudspeaker, Built-in Microphone. 14. Media File: Photo File Formats Support:JPG, JPEG, BMP, GIF, PNG, TIFF Video File Formats Support:MKV (h.264hp), AVI, RM, RMVB, FLV, MPEG-1, MPEG-2. 16. Adapter: DC5V 2500mA Plug Type Optional:USA , EU, UK and Japan etc. 17. Accessories:vPower Adapter, USB Cable, User Manual. A telescope is an instrument that helps in the observation of remote objects by collecting visible light. 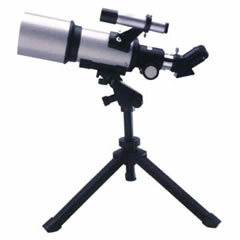 It is an optical instrument used to view heavenly bodies such moon, stars, planets and distant objects. The objective is a convex lens of large focal length and large aperture. It usually made of two convex lenses in contact with each other to reduce the chromatic and spherical aberrations. The astronomical telescope makes use of two positive lenses: the objective, which forms the image of a distant object at its focal length, and the eyepiece, which acts as a simple magnifier with which to view the image formed by the objective. These are the telescopic systems designed for occupation and reading. The good thing about them is that they allow an increased working distance that which is found with a comparably-reading microscope while still maintaining an adequate magnification level. A system designed for distance can be capped only when required to do close work or dedicated reading system can be made in monocular or binocular form.